Sad news about losing Bobby Murcer this past weekend. He came into the major leagues with the tag "heir-apparent" to Mickey Mantle as the center fielder for the NY Yankees. Now, of course, no one can live up to those expectations, and Bobby didn't, but he one was hell of a ballplayer and an even greater man. 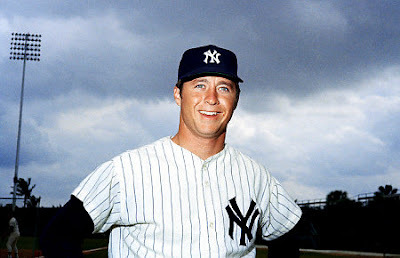 Murcer played for 17 seasons between 1965 and 1983, mostly with the New York Yankees, whom he later rejoined as a longtime broadcaster. A Gold Glove winner and five-time All-Star, Murcer led the American League in on-base percentage in 1971, and in runs and total bases in 1972. From all accounts Bobby Murcer was one wonderful man. Young players all talk about how he was approachable and generous in his openness when he was asked for critiques and advice. 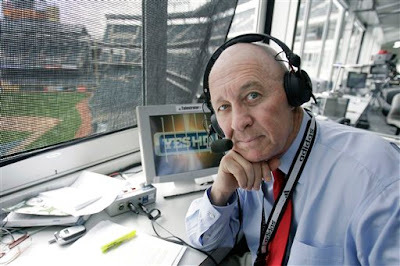 Murcer was diagnosed with brain cancer in 2006 and had whole nation rooting for him after he was diagnosed and said he wanted to return to broadcasting. Mercer did return to the booth on opening day last season. Murcer passed away Saturday afternoon in Oklahoma City surrounded by his family. He was 62 years old. He is survived by his wife Kay, his children, Tori and Todd, and his grandchildren. One of my guilty pleases began last night..."Big Brother"...yeah I do watch it and it is the one reality show I have thought about sending in an application to become a contestant. Would be nice to get a shot at that $500,00000...but the only way I could do that is if I had like hit the lottery and then I wonder if I would still want to go into seclusion for that long a time. What? OH, you are waiting to hear the plans....hummm OK, let's see...do you believe talking about things like this jinx you from having it happen? Or do you think you should voice your dreams and fantasies for them to happen? Or don't you think it matters one way or the other? His name is Newton Faulkner and the video for his first single, “Dream Catch Me” is now available HERE. He has a nice sound to his music. I would reserve judgment until I hear the rest of the album. Already blazing up the charts on VH1’s VSpot Top 20 Countdown, I am waiting for the CD to come to me and I will review it here on The Couch. “Dream Catch Me” is the first single from Newton Faulkner’s debut album, HAND BUILT BY ROBOTS, released on April 29. Also, be sure to check out Newton at this summer’s hottest music festivals including the Mile High Festival in Denver , CO on July 19th and Lollapalooza in Chicago , IL on August 3rd. I am working on moving things around to try and solve this problem. This is from the DOG DAYS album from Atlanta Rhythm Section...The album opens with this song, "Crazy". I always considered them a "lite" Lynyrd Skynyrd. All snaps or pos were not able to be deleted without altering the music tracks. Sad news indeed about Bobby Mercer. I loved the Yankees as a kid, mostly because of Mantle, then Mercer, both coming from my home state of Oklahoma. I watched Big Brother early on...season 1, 2, and 5. Lately, I can't get into it. Maybe Jerry will help me root for the "old guys". Probably not. Here's to Bobby. He was one of my faves when growing up, and I am not even a Yankees fan. Cheers Vinny!! I favor the Metropolitans, but if ever there were a Yankee that made me cheer it was Murcer and maybe you should add Catfish to the list as well. Mercer was one of those Yankees I could never root against. As a Dodgers fan, I detested the Yankees. But never Mercer. I never did get into Big Brother. I didn't like Survivor because it was too conniving, and BB always struck me the same. ...haven't heard from ARS in some time...thanks for the memories.....how 'bout some Wet Willie? That was sad news about Bobby Murcer. Good luck with the "Big Brother" thing, though. I've never had the guts to even think about doing something like that, so I wish you the best of luck. NYD: Both great players...should we add Donnie baseball too? Jeter maybe? PHFRANKIE: Glad you enjoyed...I am going in alphabetical order...will be a while before Wet Willie comes up! I'm not a Yankees fan, but Bobby Mercer was one of the best. And he was a much better ballplayer than most people give him credit for. I have a plan of things to do when I win the lottery. I tweak it from time to time even. You can win $500,00000???? really? You're going to have to start posting on weekends if you end up with so much pent up stuff to say. Interesting question about making your dreams come true. I guess it depends on whether or not you wished on your birthday candles or upon a star. I think you have to commit to want you want and voicing it is probably the best way of doing it. Of course, a person's mindset is what REALLY determines this. If you believe in "the jinx" and are into esoteric stuff like that then I guess saying it outloud will lead people to fail, thus leading to a self-fulfilling prophecy phenomenon. It's a placebo effect in my opinion. But that's just it, an opinion. Unfortunately, I think you've put so much in this post that this truly interesting question got lost. Oh, and "Lynyrd Skynyrd lite"(fix that typo please, for a music lover that one screams out, m'kay Vinnie?)? um... no. Maybe it's me, but that song loses all it's edge as soon as Buddy starts singing. Can't believe I forgot BB10 last night... *sigh*. I'm with Anndi in that I really would like to explore that question about dreams and making them reality. I play the lottery too. I get on the freeway almost daily! Among the normal pay off the house, nice car, etc... I'd buy back all those baseball cards I foollishly sold as a kid. At least one of which was a Bobby Murcer card. I admit I've fantasized in the past about submitting an application to a reality show - but real life has gotten more interesting so the urge subsided. I liked the Newton Faulkner video - the concept and lyrics are great but the music sounds a bit thin to me - could be the crappy speakers on my computer, though. The ARS makes me want to grab a spliff and a sandwich and head to the beach! I just read this sad news on Bud's blog this weekend. What a sad sad day for baseball and more importantly his family and friends. They don't compare to Skynyrd, not even in a lite way. Nope! If you're going to pose a serious question make it the focal point. Sometimes the best stuff on a blog comes out of the comment section. Oh wait.. I get it. you were hepped up on the sake when you wrote the second part!!! AHA! I was sad to hear about Bobby too-he was a class act, all the way...so sad to go like that, too. JEFFB: LOL funny guy and yeah, my brother and I sold ours about 15 years ago. ADR: Funny recollection of ARS. Not sure about Faulkner...need to hear more. ANNDI: I will look closer on the typos...but it is part of the charm of coming her. MAGS: A painful way indeed. Really loving Newton Faulkner - great tune!